I've received several messages/e-mails from readers asking me about my Weight Watcher recipes, what I eat regularly, etc. I decided to briefly discuss this here since these fritters are a wonderful WW recipe. If you aren't interested please skip down to the third paragraph and enjoy reading about these delicious fritters! I have done WW on and off for years- most recently on and very devoted to making it a "lifestyle." "Lifestyle" is a phrase you will hear used a lot to describe WW and it is quite appropriate when you treat WW as something you will do for life rather than a diet. Seeing as how it's the New Year (aka resolution time for most) and I have had readers asking I figured I'd give you a brief explanation of my WW recipes. I strongly, strongly, STRONGLY believe in eating real food. Grilled chicken, steamed veggies, and brown rice is ok. Once every two months. That is not dinner to me. I need to explore in the kitchen, create, and enjoy my meals. That makes WW more challenging and more rewarding. I strive to create real meals that taste like they aren't missing an ounce of flavor. I find my recipes in several places: Eating Well, Cooking Light, Weight Watchers Online (you need to pay to access most of them), and several magazines/cookbooks. I calculate the points for my recipes based on the ingredients I use. If you alter or modify you need to recalculate. Also, one ingredient can vary greatly depending on the brand. My 2% cheese and your 2% cheese are most likely different brands. The nutritional info could be the same or quite different. Please take my points values as what they are, MY points values. They are accurate for what I used and are most likely accurate for yours as well but it never hurts to double check. Lastly, this is NOT a Weight Watchers blog. I make decadent desserts, bake regularly, and also enjoy non-WW recipes. Ok, that was long winded... on to the fritters! Ohhh boy- these things are gooooooood. I came across this recipe on Weight Watchers website and knew I would have to make these soon as a side dish. I have only had fritters once and they were shrimp fritters, deep fried, and full of fat and flavor. I was hoping these would be similar even though they weren't fried and they definitely were. They pepper gave them a great flavor and the texture was spot on. I served them with a spicy ranch dipping sauce and it complimented them well. I think you could use salsa or even regular ranch too. 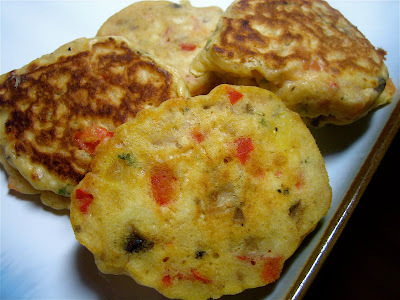 They look and have the consistency of pancakes but are loaded with veggies and flavor. I will definitely make these again. I am considering making them mini and serving them as appetizers- perfect if you ask me! oh yum, these look good! I'm on a mission to eat more fruits and vegetables, and this sounds like just the recipe I need. can't wait to try them!